The westbound Interstate 76 ramp to 30th Street will be closed and detoured beginning July 20, 2018 for repair and resurfacing. The closure will be in place through mid-August. I-76 West motorists normally using the ramp will be directed to exit at South Street, turn right on South Street, left on 22nd Street and left on Market Street to reach 30th Street. 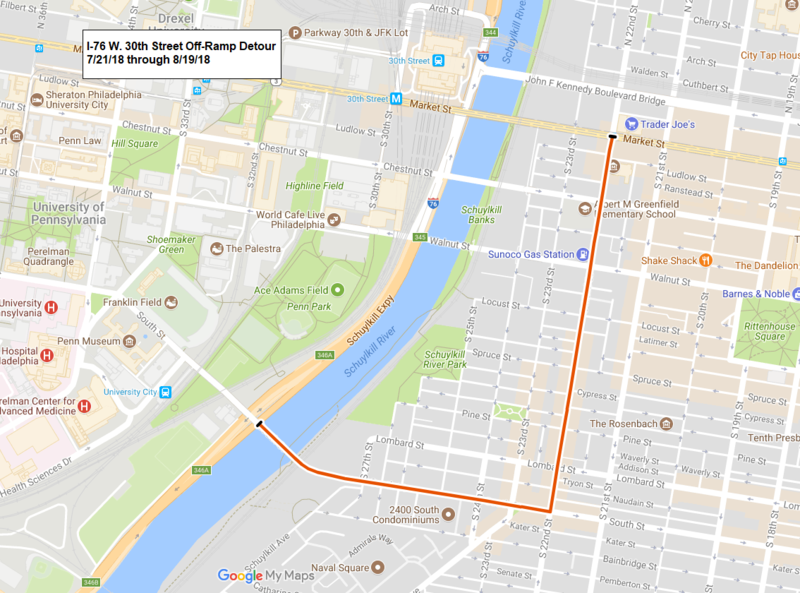 Northbound Schuylkill Avenue is closed until 2019 between Walnut and Chestnut Streets. Walnut Street motorists heading for 30th Street Station, the ramp to westbound I-76, and the ramp to eastbound Interstate 676 are detoured west to 30th Street, then right on 30th Street to Chestnut Street, and right on Chestnut Street to Schuylkill Avenue, then left on Schuylkill Avenue to Market Street and the ramps. Pedestrians may continue to use the sidewalk on the west side of Schuylkill Avenue. Southbound Schuylkill Avenue is closed until 2019 between Market and Chestnut Streets for rehabilitation of the viaduct over Interstate 76. Market Street motorists heading for the ramp to eastbound I-76 at Walnut Street are detoured east on Chestnut Street to right on 23rd Street, and right on Walnut Street to the ramp. 24th Street is closed under Chestnut Street until 2019. Local detours around the closure are in place. Detour map for the westbound I-76 30th Street off-ramp closure.